Our platform solutions help businesses navigate the complexities of the rapidly changing marketing and ad tech platform marketplace. We provide unbiased recommendations and implementation / integration support in a way that’s closely aligned with overall business needs rather than those of the technology solution. The marketing and ad technology landscape is one of the most complex aspects of modern marketing – the now famous lumascapes are often used to present this complexity. 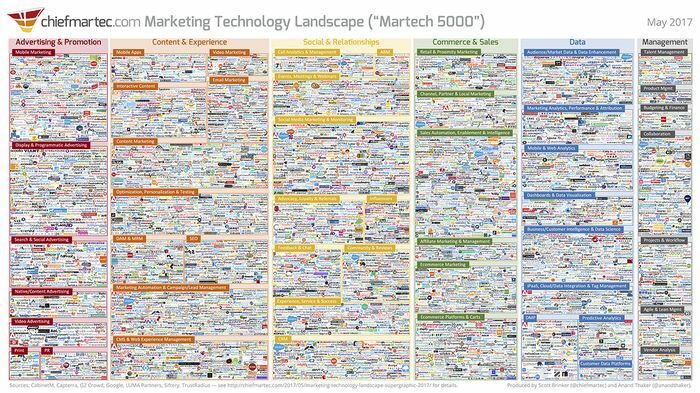 The 2017 Marketing Technology landscape - "Martech 5000"
For the uninitiated exposed to the sales teams from these platform partners it’s definitely overwhelming, and it’s difficult to read between the lines and move away from sales into answering the “is this the right solution for my business” question. If you feel that you’re not getting the right level of support from your partners, or are starting to feel that you need to replace technology platforms utilised by your business then it’s time to get in touch with us. We’ve experienced and supported clients to improve partner relationships and to maximise the use of the products – fixing this problem can save tens of thousands of dollars in project management time. Partner relationship management to help you maximise ways of working with your partners to increase the value of the partnership. Sales management process to help you through the platform evaluation. If you feel that you don’t have the expertise to ask the right questions we can provide support during the sales process. In the platform world it’s essential that marketers have a solid operating structure in place to ensure that teams, technology, data and platforms speak with each other in the most efficient way possible to ensure efficient operating models. Recommendation workflow to facilitate automation of process steps and delivery of efficient systems usage.